Koenigsegg is only building 25 examples of its Agera RS supercar. Each 1,160-horsepower car undergoes testing before making its way into the garage of the lucky owner. One customer will have to wait a bit longer, though, as an Agera RS has crashed during shakedown testing in Sweden, says Koenigsegg. The incident occurred at the National Electric Vehicle Sweden (NEVS) test track in Trollhattan, where Koenigsegg tests cars bound for the US market. The automaker says the driver lost control on the wet track and doesn't believe there to have been any mechanical failure. The driver and the passenger were both taken to the hospital but have already been released. 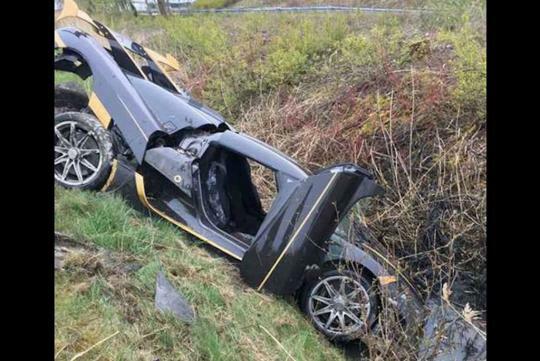 As for the car, it received some body damage, but Koenigsegg says an initial inspection didn't turn up any structural damage. The Koenigsegg Agera RS is powered by a twin-turbocharged 5.0-liter V8, producing 1,160 horsepower and 944 pound-feet of torque, though another recent example belonging to an American customer was tuned to 1,360 horsepower and 1,011 pound-feet of torque. The car debuted at the 2015 Geneva Motor Show, and all 25 units have been spoken for since January 2016. KBB says its price is somewhere north of $1.5 million.